Located near Wilmot, Wisconsin, Camp Sol R. Crown has 146 acres of rolling hills with wooded and open areas, campsites and a heated shelter make weekend campouts a memorable experience for Scouts. This campground is used for training, weekend activities, unit campouts, Camp-O-Rees, Webelos Woods, and winter camping events such as OKPIK. Home of the Frank Jadel Training Center, a state-of-the-art facility for advanced training, Camp Sol R. Crown is ideal for hosting events large and small, from District-wide campouts to corporate retreats. What’s happening at Camp Sol R. Crown? 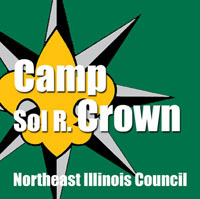 What are the amenities at Camp Sol R. Crown? Jonathan Miller Cabin: Sleeps 28. This large new cabin is open year-round and features private sleeping quarters, along with a large group sleeping space. Please see the Miller Cabin page for details on accommodations and cabin rental. Fisher Shelter: Sleeps 20-30. This garage was converted into sleeping/daytime usage space. It has heat & electricity, slab floor, but no beds or running water (winterized pump nearby). Foldable tables & chairs inside. Near latrine; has small parking lot. It can be used for sleeping, training, or as “check-in” station. The Frank Jadel Training Center: This training center is ideal for large or small conferences and meetings. Many units reserve it for Eagle Courts of Honor, Blue and Gold Banquets, and unit overnight stays. The building is equipped with a catering kitchen and has full restrooms and shower facilities, a large & small conference room, and 2 covered outdoor meeting spaces (covered wings with picnic tables). The large conference room has sound-proof dividing walls to make 3 sections; each fits 60-70 for training purposes and has its own entrance.